Burgundy or reddish-brown undershirt. Mandarin-style collar seams attach in front - can be worn either open or closed up the neck. No exposed closure. Dark orange/pumpkin outer-jacket made of a heavy-weight or sueded material with large cuffs. The underjacket lapels should show on top. Outer jacket has large, diagonal exterior (or mock-exterior) pockets with a squared-flap. Pockets are located at hip or upper thigh level. Burgundy or reddish-brown pants. Color should be a close match to the undershirt. Medium to dark brown leather gloves. Close fitting, with short cuffs (not gauntlets). Dark brown leather belt & harness w/appropriate pouches and straps. 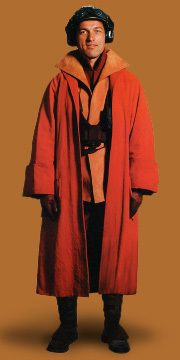 Low-heeled medium to dark brown boots with matching-color Naboo-style strapping pattern/spats (like Padme�s Battle Outfit). Orangish red sueded cloth pants with no visible pockets. Charcoal gray/grayish teal leather or pleather V neck vest that is longer in the back with side closure and double line piping. 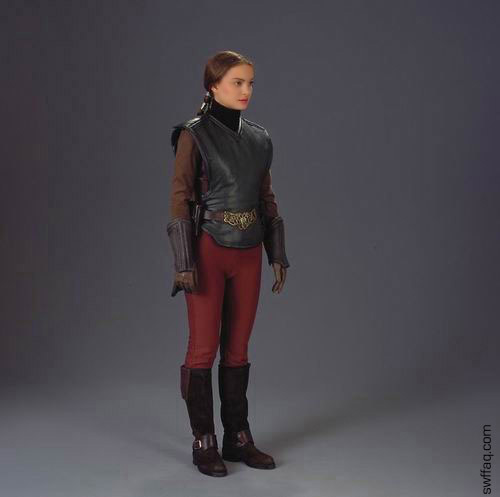 Brown knee-high boots with Naboo-style strapping spats (like Padme�s Battle Outfit). Dark brown leather or leather-like bracers/gauntlets with double line piping. Naboo N-1 flight helmet(with full faceshield). Accurately-styled Naboo fighter pilot blaster attached to belt via covertec clip.